← Excerpt: Isabella’s Painting book 1 in Ellen Butler’s Karina Cardinal mystery series. 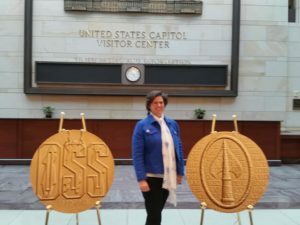 On March 21, 2018, in the midst of a Washington, DC snow storm that shut down the federal government, the Office of Strategic Services (OSS) was recognized with the highest civilian honor Congress can bestow – the Congressional Gold Medal. 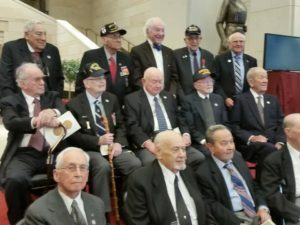 Over 75 years after the OSS, the predecessor to the CIA, was formed Congress presented the medal which was accepted by Charles Pinck, President of the OSS Society, and approximately 20 attending WWII veterans. Of the 13,000 people who worked for the OSS at the height of the war, it is estimated that there are only 100 surviving veterans left. Though only 20 veterans were present, Emancipation Hall was packed full with family members, friends, and supporters of the OSS. 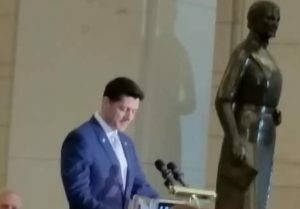 Speaker of the House of Representatives, Paul Ryan, presided over the event at the United States Capitol, opening with moving words about to William “Wild Bill” Donovan. In 1941, before the bombing of Pearl Harbor, Roosevelt knew it was only a matter of time before the United States would enter the war. Realizing that our own intelligence was spread across the varied defense organizations, the FBI and State Department, he appointed Donovan as Coordinator of Information to begin the task of creating a single over arching group to gather and assess intelligence data. After the bombing of Pearl Harbor Donovan’s group became operational and was named the Office of Strategic Services. These men and women not only analyzed data for the war effort, they also dropped behind enemy lines in the dark of night to organize resistance groups, helped POWs escape into Allied territory, infiltrated enemy groups to provide intelligence, and much more. The OSS hired a wide variety of military, civilians, races, religions, genders, and even a few criminals to carry out their mission. Operatives worked in secret and for so many years their contributions remained unknown. 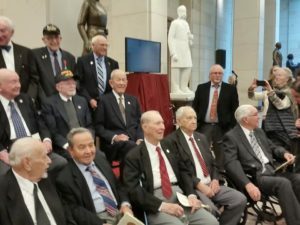 With the Congressional Gold Medal, their bravery has finally been given the recognition it deserves.